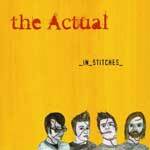 The Actual - "In Stitches"
Today's guest stars are the California based pop-punk band called TheActual. We join them on their patchwork recording, four years in the making, to find out what keeps them in In Stitches; their new release on Scott Weiland's (STP and Velvet Revolver) Indy label Softdrive Records. The influences which make up The Actual's musical landscape is like a wall of sound tagged by Hüsker Dü, Simple Plan, and Queen, with Agent Orange highlights. Their introspective skate punk lyrics on this 13 song release speak mostly of social self worth: either you have it or you don't. "The Pride of the Echelon" sets the tone, but not the text, for the record. It is a song about letting your dreams escape you. The rest of the songs, or at least the lion's share, are about females: and more importantly the problems that come with them. Two of the more interesting ladies on the release are a Devil-Worshiping-Good-Girl-Pixie in the song "September Had A Trigger Finger," followed up by a"Permanent Kitten" with catchy guitar hooks that have 9 lives of melodic sound. You are going to be rocking out with these songs all summer long. The first single off of the album is, "This Is The Worst Day Of My Life (Do You Want To Come Over)." The Actual set up a melodramatic tone that doesn't sink into the awe-shucks-Emo-band self-indulgent rhetoric. This song has a duality, not unlike the title of the record. It poses the question to the listener; if he sings it will she come over? "I would want it be performed by another band that I thought was really great with a girl singer and have it like a conversation between two bands."